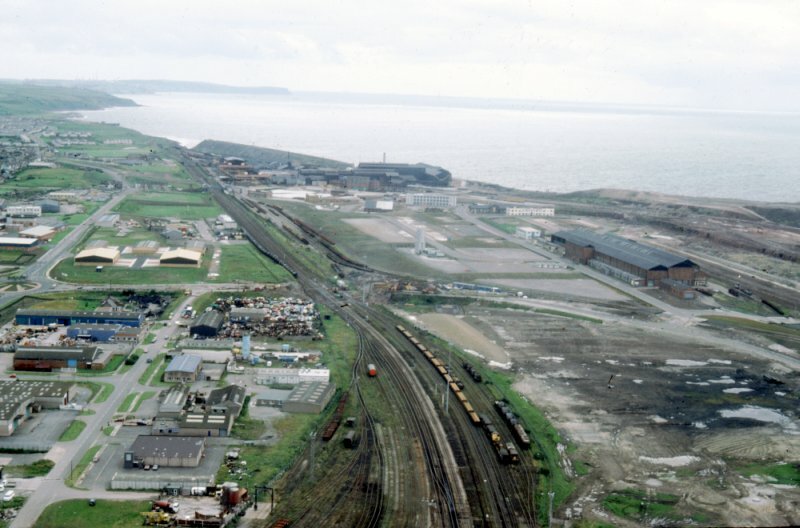 Moss-Bay, the west of Workington and the Marsh, 1984. CLAY FLATTS, NEW YARD, AND THE WEST OF TOWN. The year is 1985, and a humdrum saturday is enlivened by a helicopter visit to the Cloffocks, offering trips over the town and surrounding area for £10.00 a go. As well as capturing the Grammar School, industrial Siddick (pre-wind turbines) and the Technical College from the air, I grabbed these shots covering the west of town, Moss Bay, and the Marsh. 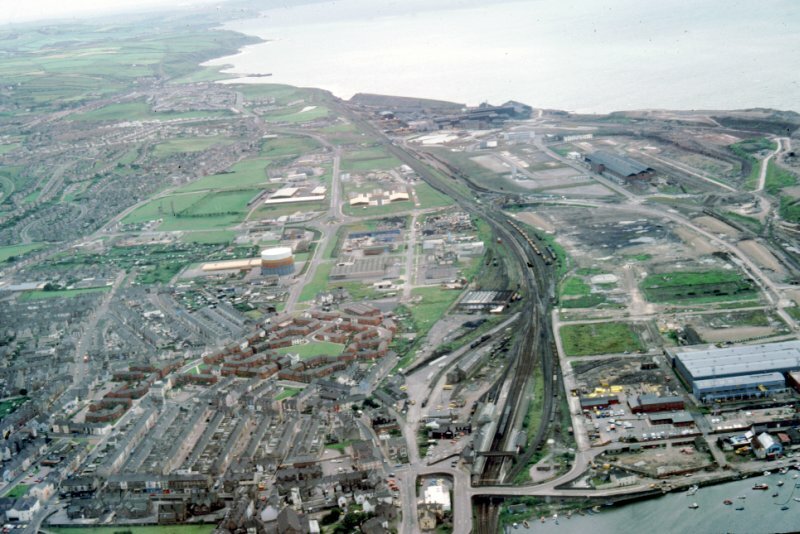 Only four years earlier, The traditional heavy industries of Workington had diminished to a token effort, with the loss of the Derwent Blast Furnaces, Sinter Plant, Coke-Ovens, associated works, and the Chapel-Bank foundry. Mining and steel-making succumbed over a decade before these pictures were taken. Remaining today are the Rolling Mill, A1 Sheds, and the engineering side of Chapel Bank. CEW (Central Engineering Workshops) - visible in the photographs - has moved to A1 sheds at the southern end of the works. Plans were already afoot in 1985 to create an 'out-of-town' shopping arena where the Berry Street end of the Marsh stood, on New Yard. Once a works scrap-yard and allotment gardens, this parcel of wasteland now accommodates the likes of Halfords, Safeway, and Currys. The Burmah Road is busy again, and work is once more created - albeit on a greatly reduced scale. Clicking on the images below will lead to an enlarged version of about 100Kb size. The picture on the left is of the western side of town, clearly showing the new housing enclave behind Hawksley Terrace and the 'Railway Cottages'. The by-pass is only complete from Moss-Bay to the roundabout on clay flatts. The 'Burmah' road is as it always was, bumpy, rough, and unmetalled in parts. Close inspection of both pictures will show that the Burmah Road bridge is down, to be replaced with the new 'Bessemer' bridge - built to carry traffic to the proposed out-of-town stores. The old Central Engineering Workshops and the Derwent Electrical shop stand isolated amidst the dereliction of the steel-works, with all the work being concentrated at the southern end of the plant. The old slag-bank, a relic of the Moss-Bay blast-furnaces, inclines gently southernwards before falling sharply at the end of Shore Terrace. It has now been rounded off and the area tidied up.